Our vacation in St. Louis was only a couple of days. Two to be exact. From there, we moved on to Peoria, IL for a couple nights. J and I met in Peoria almost 11 years ago and we haven’t been back since we moved to Michigan in 2008. I had really hoped to make one more stop in St. Louis for a meal. One of my goals when we planned the St. Louis trip was to stop at Schlafly Brewing, but that wasn’t in the cards. We stopped for frozen custard instead at Ted Drewes then got on the road. The good news is, I always have a back up plan. I’ve blogged a little bit about regional foods in the past and it doesn’t get more regional than the horseshoe sandwich in Central Illinois. No one outside of this area has ever seen or head of, let alone eaten, a horseshoe. I feel sorry for those people. Horshoe’s are one of the great heart attack inducing foods in the country. A quick history lesson. The horseshoe is an open-faced sandwich invented in Springfield, IL. The basic structure is thick bread, meat (historically hamburger patties), fries, and a cheese sauce. Yes, fries on top of the meat and the whole dang thing is covered in that cheese sauce. The original restaurant is no longer in Springfield, but there are a couple of great options when it comes to finding a horseshoe. 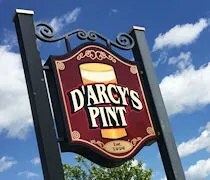 One of those options is D’Arcy’s Pint on Stanford Avenue on the south side of Springfield just about a mile west of BL-55. We were coming from the south, so the quickest way to get there was to get off of I-55 at the Business Loop and follow that up to Stanford. It’s not a stop that’s right off the highway, but it is a detour worth making. 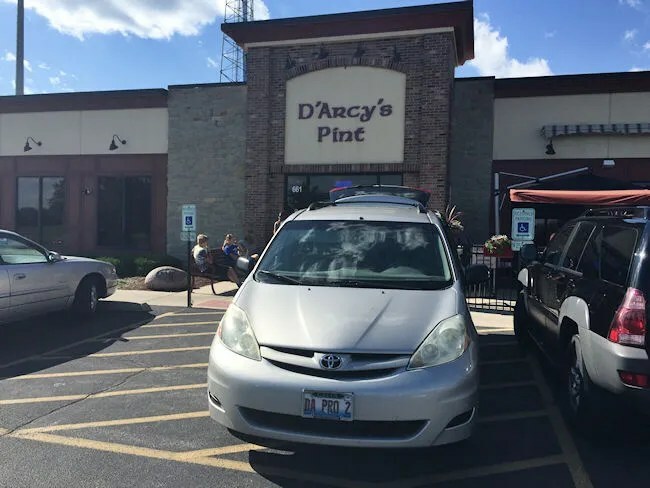 D’Arcy’s Pint is a casual Irish American Pub. There are two large dining rooms with their own bars and gaming machines. This is most likely a hold over from the smoking days in Illinois restaurants. As it it now, it gives the space a kind of odd feeling. On the plus side, we were seated in the room with more families, so it wasn’t as big of a deal that J had to take both kids out of the restaurant at one point due to attitudes. I wasn’t really planning on getting a beer when I sat down, but they actually had a decent craft beer selection. 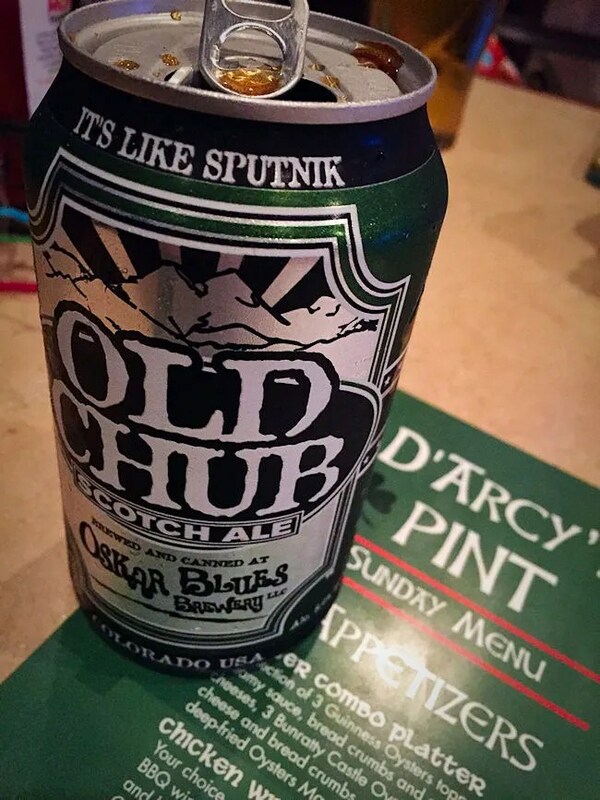 I ordered an Old Chub from Oskar Blues. The beer came out in a can and I wasn’t offered a glass. Scotch Ales are more sipping beers for me and drinking out of the an is odd, but it didn’t distract from the flavor of the beer. Unfortunately, Illinois doesn’t really have the beer scene like we have in Michigan and there was nothing even remotely local on tap or in bottles/cans. J ordered an Angry Orchard which was on draft. I didn’t even bother to look at the rest of the menu. I knew what I wanted. It was the whole reason we stopped where we did. I skipped down to the “Darcys Famous Shoes” part of the menu. They actually have a number of meat options plus some veggies options for the shoes. In addition to the horseshoe, they offer up a pony shoe which is half the size of the big brother. I stuck with the original and ordered the hamburger horseshoe. This dish is one of the things I really miss about my time in Central Illinois. Darcy’s horseshoes don’t really try to reinvent the wheel. 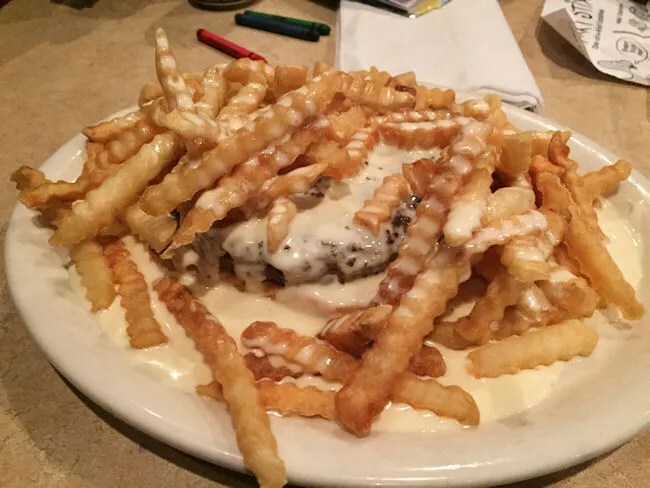 They started with toasted Texas Toast followed by the meat…hamburger in this case, then a large handful of crinkle cut fries and the whole thing is smothered in a rich cheese sauce. The original Welsh Rarebit sauce used at the Leland Hotel isn’t hard to find (I just linked it for your….you’ll thank me later), but I’m guessing Darcy’s doesn’t use that exact recipe….close…but not quite. The cheese sauce at Darcy’s is super rich and very thick. There was so much on the plate that J was reaching across the table to dip some of her fries in it too. The sauce can make the bread a little soggy, but toasting it allows it to keep some of that crunch. 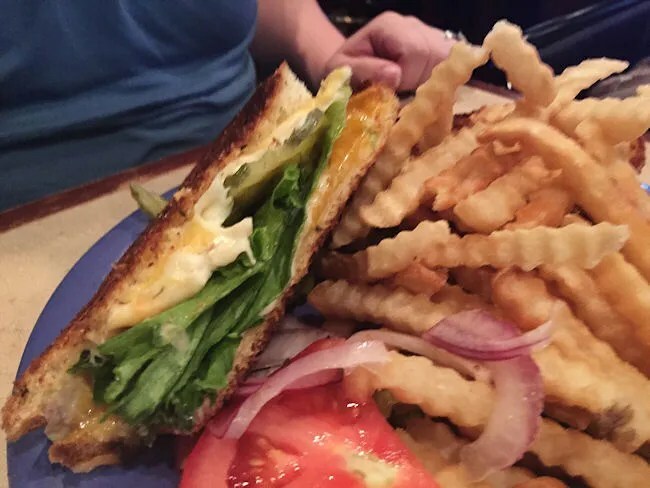 The perfect bite of horseshoe is a little bit of everything. Bread, meat, fries, cheese. There really is nothing fancy about a horseshoe other than the cheese. A good sauce will make almost anything delicious and Darcy’s has a good one. J ordered the Ultimate Cheese Toasty. This grown up grilled cheese is actually corn bread with Pepperjack, American, Swiss, and cheddar cheeses. The menu doesn’t say it anywhere but it also comes with lettuce, tomato, and onion. J wasn’t sure she had the right sandwich at first until she took a bite and realized the bread was the corn bread. She took off the extra stuff she didn’t want leaving mostly the grilled corn bread and cheeses….which she said was delicious. As I mentioned, her sandwich came with fries and she stole some of my cheese sauce to dip them in. Not because the fries necessarily needed it…but because the sauce was that good. L’s meal was another bust and there’s no way it should of been. 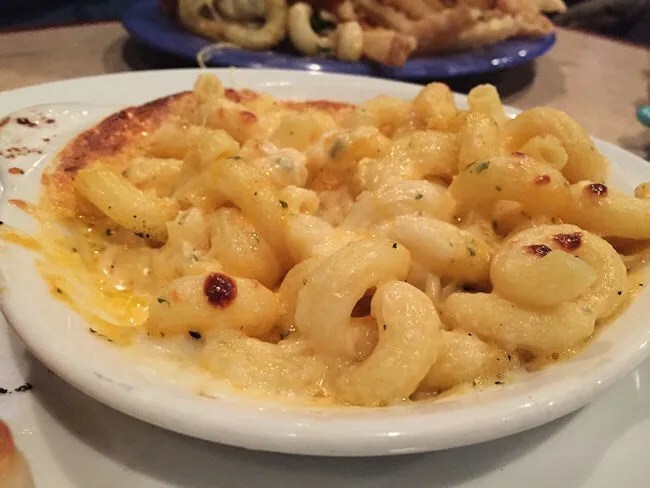 We gave her another chance to order for herself and she chose the Child’s Mac & Cheese. A delicious bowl of elbow macaroni and cheddar cheese came out, BUT the top had been toasted and there were “green things” (spices) on it so L wouldn’t even give it a chance. This was frustrating for us because it was actually really good mac & cheese and she would have loved it had she tried it. She used to eat anything we put in front of her without questioning. Now she’s become the picky eater we so hoped she wouldn’t be. Hopefully it’s a phase and this will pass because she’s missing out on some really delicious dinners. We had been traveling a lot the two days prior to this trip and we had spent four hours outside at the St. Louis Zoo. As you can imagine, both kids were exhausted. J took them both to the car and left me to pay the check. The bill was just over $32 before tip…and I tipped more than I normally would. We were kind of frazzled and the kids were exhausted. The waitress and anyone who came by our table was extremely kind to us and could tell we were struggling a little bit. D’Arcy’s Pint is kind of legendary when it comes to the horseshoe sandwich. They didn’t invent, but they have made it their own. I’ve wanted to take a bite of a D’Arcy’s horseshoe for many years and I can now rest easy that it has happened and it lived up to the hype. Good Luck with your daughter and being picky. Our youngest son was picky from age 3 to age 19!!!! I hope it’s a short phase…but I was a pretty picky eater when I was a kid…I’ve gotten better but not as good as I should be. I never knew I wanted/needed a horseshoe sandwich in my life until now! Right? I grew up closer to Chicago and had never seen one until I moved to Peoria. I don’t understand why this hasn’t caught on anywhere else.